These convenient heavy-duty countertop dispensers have heavily weighted bases to prevent slipping. Made of high-impact plastic in an almond beige color, they have foam rubber bottoms that won't scratch furniture. #C-22 Heavy-Duty Tape Dispenser — Convenient, countertop dispenser for single rolls up to 2" wide or 2, 1" rolls. Same non-slip design and color as the C-23. 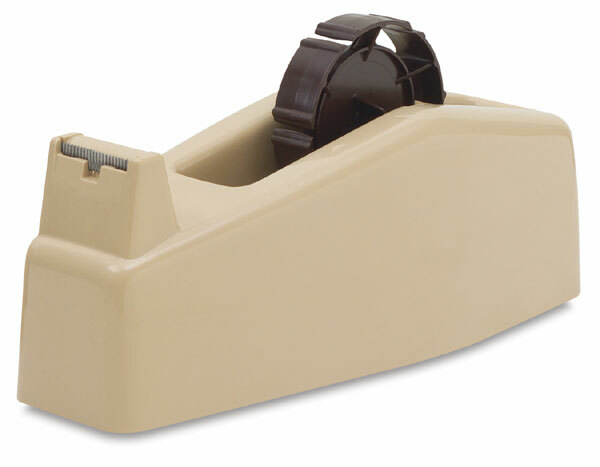 #C-23 Heavy-Duty Tape Dispenser — Extremely durable for tapes with 3" core with maximum width of 1".